Is Your Lazy Parenting Setting Your Kids Up To Fail? This is one of my first rants, so buckle up! I have a lot of opinions about a lot of stuff and I think I’ll be sharing them more. 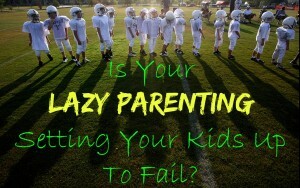 I think we are doing our kids a disservice as parents, and setting them up to fail AND I think it’s lazy. In my opinion, we want our lives to be easy, but we are using the kids as an excuse and say we’re doing it for them. Here’s what I mean. When I was kid, not everyone got a trophy just for being on the team. Not everyone got chosen to BE on the team. In fact, some people were even cut from the team! Shocking, I know! But, what I have seen over the past 30 years raising my kids is that all of the kids get a trophy for participating in anything, and everyone gets to play every game, and some organizations don’t even keep score for fear it might hurt someone’s feelings… really?! This is what I am talking about, we are setting them up for failure. Listen, they are gonna fail, they won’t all be chosen for the promotion, they won’t all get their dream job, some of them will be fired. There will be people in the world who just don’t like them, and that’s okay, it happens. Unfortunately we as parents aren’t allowing them to fail, we can’t teach them how to handle rejection, failure or disappointment, if they never experience it. BUT, the worst part here is I think we are not allowing these things because we are too lazy to mend their broken heart or teach them how to overcome being cut from a team because they weren’t good enough. It’s easier for us to not have them disappointed or sad or broken, but, they weren’t put here for our lives to be easier. Parenting is hard, childhood is hard – we need to BE the parents, we need to say no, and tell them to get over it, when needed. Why in the world would we raise them up to think that life is a box of chocolates and then turn them out in the world, and they have NO idea of what’s coming, and then… they have no skills to handle it when things don’t go their way. THEN we say get over it, grow up, be an adult…. we never taught them how. We wanted their childhood to be nice, and sweet, and rosy… but, for them? Or was it easier on us? It’s hard to be the bad guy sometimes, but, we have to do it to help mold them into thriving members of society. Have you thought about it? Is Your Lazy Parenting Setting Your Kids Up To Fail? Everyone has advice, everyone needs advice from time to time, but, advice is not always taken in the way it’s intended, sometimes the problem is in the delivery. Some people are pushy with it and some people, not so much. When I was a first time Mom, my Mother-In-Law was… well, pushy is a nice word. She could not understand why I wanted to nurse my baby, why I wanted to wait to feed her table food, why I wanted to use cloth diapers, why I did anything! I mean it was bad. One day my Mother-In-Law and Sister-In-Law ganged up on me and I got my nerve up to tell them this was my child, they had already raised their’s the way they wanted to and now I would raise mine the way I wanted to (I guess I should also mention that the bags were packed and we were 20 minutes from moving to another state forever when I finally spoke up…). But, I am older and wiser now (I hope) and looking back I should have done it sooner and in a more cordial way. Today I tell all young Mothers and Moms-to-be the same thing: “You’ll get a ton of advice. Take what you like and throw out the rest – even from me!”. I truly mean that, there are as many theories on anything as there are people living. Advice isn’t a bad thing to receive, sometimes it’s all good, or partially good, but, one thing I have found is the advice that resonates with you and you feel good about, that’s usually the advice for you. The rest is, well… “noise”. Listen, be nice, and reply with something like “Thanks, I’ll think about that, or I’ll ask my Dr. about that.” then (as they say), keep it moving. No need to bog down in drama and fighting and rethinking how it was said or what their “real” intentions were. It’s your life, do it your way and be happy about it. Trust me, you have given unwanted advice, and your advice has not always been heeded, and that’s ok, just like it’s ok for you to not take advice or take parts of advice and not all. 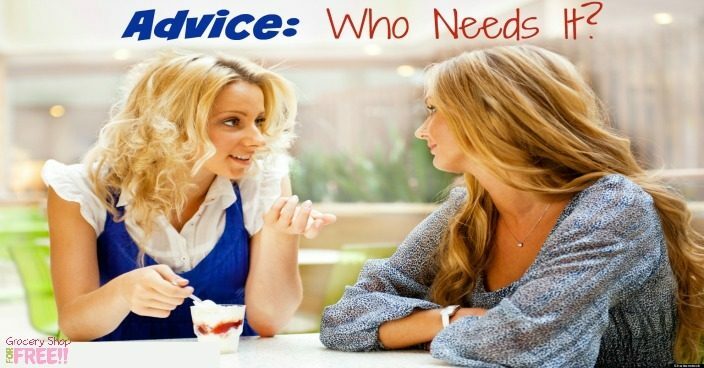 I try very hard to not given unwanted advice… I don’t think I do a good job of not giving it, though! Maybe that’s why I am here, sharing my advice (which is what I am doing now 🙂 ) with you! People who offer advice do it because they have “been there and done that”, but, we all know all situations are different just like all pregnancies and kids are different, so I do believe most advice is well intentioned. I guess in answer to the question Advice, Who Needs It – we all need advice from time to time, even unwanted advice, but, it’s how we handle the delivery and how we receive it that really counts. Just remember what I said “You’ll get a ton of advice. Take what you like and throw out the rest – even from me!”. 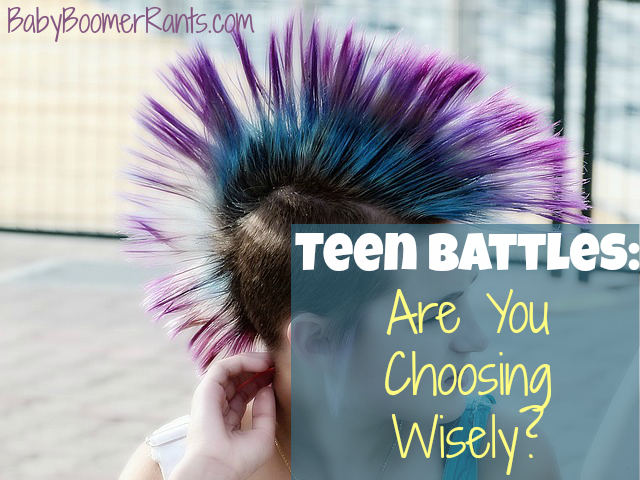 Teen Battles: Are You Choosing Wisely? I have mentioned in the past that we have now raised 4 teens and we were Youth Pastors for 15 years and had worked with Youth Pastors for years before that. One thing I have run into quite a bit with parents is their complaining about their kid’s choices. Now, I am not talking about choosing bad friends, or choosing to skip school, or choosing to set random fires… I am talking about choosing to color their hair or parts of their hair purple or green, choosing to wear navy blue nail polish, or even whitish makeup or weird haircuts. But, my response to all of that when parents complain to me was and is: “If purple hair is your only teen issue… you don’t have a teen issue.” Truly, your parents (yes, I am old) didn’t like your hip huggers, mini skirts, long hair on guys, hair metal bands, punk rock, screamo or rap music. But, you turned out fine. Choose your battles, is it a hill worth dying on? Trust me their will be REAL teen battles and absolute hills worth dying on and PLENTY of them… hair style/color, and most clothing choices do not fall into that category. Will dog collars and white makeup mean your child will become a “Satanist”? I have known many teens who did all of that and none of them are now worshipers of Satan, they are married normal, loving parents who no longer where dog collars and white makeup :). How do you know when to worry? When your kid retreats from the family, seems depressed or overly angry. I have found that these are all signs that there is something bothering them and often they feel guilty or are carrying a weight too heavy for them and they don’t know how to talk to you about it. I am blunt with my kids, not mean, but blunt. I ask outright questions, the hard ones, the ones you don’t want to get the wrong answers to, but, those are the ones that open the gap, start them talking and when I get an answer I don’t want, I don’t freak out – at least that’s my goal. My Mom once told me that we often told her things she didn’t really want to know and she felt the reason was that she never acted shocked and that way we never tried to shock her. I have tried to use that with my kids and it worked well for us. Even now with the last one at home. Their friends even shared stuff with us that they never have shared with their parents even now that they’re grown with kids of their own. When your kids adopt a new “style” think first if this is something you think is worth a battle. Do you want hundreds of inconsequential battles with your kids, or do you want to wait until there’s a bigger issue you feel can’t be chalked up to weird but acceptable to you?